Cristiano Ronaldo is set to sign a new five-year contract extension with Real Madrid that would see him remain at the Santiago Bernabeu till 2021, according to reports. The deal will reportedly see the 31-year-old earn a staggering £20 million a year. According to Spanish newspaper Sport, Ronaldo’s agent Jorge Mendes is currently deep in talks with Real Madrid chief Florentino Perez over the contract, which is said to be worth £215 million over a five-year period. Real were reportedly reluctant to offer Ronaldo a lengthy contract, but the recent transfer ban imposed on them by FIFA is said to have forced their hand. The contract will make Ronaldo the second highest paid player in La Liga, behind arch-rival Lionel Messi. Ronaldo had been consistently linked with a return to Manchester United, but should talks go smoothly, it would effectively rule out a switch back to Old Trafford, as the three-time Ballon D’Or winner will be 36 years old by the time the deal runs out in 2021. 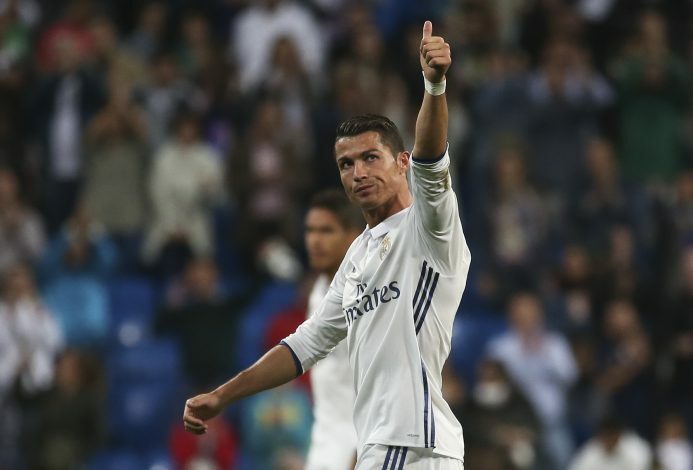 Ronaldo had said earlier that he was determined to stay at Real for another ten years, and is determined to retire in the Spanish Capital. “Things are going well. The media have written it already, you know more than me,” he said. “If I were the Madrid president, I would give me 10 more years.